The 10 Best Pizza Restaurants in New Mexico! Any way you slice it, pizza restaurants around New Mexico have their own take on how to make the best pies, and green or red chile is often part of the recipe. Whether you’re hankering for a slice of New York, deep dish or flatbread-style, you’ll find a pizza of your heart in the Land of Enchantment. This small, funky hole-in-the-wall makes a made-from-scratch thin crust, hand-tossed pie that captures the definitive New York-style pizza pie. Foldable big slices are slathered with rich tomato sauce and mozzarella cheese as a base for a wide-variety of available toppings. Calzones, spicy bread sticks and roasted whole garlic round out the New York flavors found here. House root beer tastes great with a hot slice. Only a New Yorker says forget about it as one long word, which is a tip-off to the Italian influence everywhere at this pizzeria. Per the New York-style pizza-making practices all crusts are thin, handmade and hand-tossed, standard pies are 16 inches in diameter and capture the concept of one-handed eating so popular in the Big Apple. Favorites are the New Mexico Chile, Staten Island Fresh and The Deming Wildcat. There is also cheesy garlic bread, fried ravioli and calzones from traditional old-world family recipes. Gluten free options, as well! If you are looking for the perfect ratio of crust, sauce, cheese and toppings in your pizza, you might just find it at the big red building right off I40 that is The Pizza Barn. The pan-style pizza has a thick crust which begins with dough made fresh every day and then is topped by the Barn’s signature marinara sauce and, of course, mozzarella cheese. Add your own toppings or try one of the specialties of the house: The Route 66 with roasted green chile, the Barn Burner with green chile and jalapenos and crushed red pepper or something slightly out of the New Mexico box, the Artichoke Roundup. Wine plus 22 beers on tap. This is a place to have a pizza party for the whole family … there’s a three-lane bowling alley, pool tables and video games, plus the pie is straight out of the Bronx. In typical New York pizza fashion, all the elements are there: Thin, foldable crust, light tomato sauce and homemade mozzarella cheese. Try the sans tomato sauce white pizza or the Sicilian, a 14” thick crust that comes with a choice of toppings. Unique combinations and bold flavors put together by a chef that sees pizza as more than just a snack food is at the heart of this tiny pizzeria in the Sangre de Cristo Mountains. This is gourmet pizza at its most flavorful. The Big Mountain Brisket pizza showcases an old family brisket recipe that calls for the meat to be cooked in the pizza oven for 12 hours. Throw on mozzarella cheese, barbecue sauce, caramelized onions, pineapple and green chile and this is a little slice of heaven. Other highlights include the Herbivore, Working Man and Carnivore. Each pizza comes in a 10, 14 or 16-inch size or as a deep dish. The Italians know pizza. Naples, Italy, is considered by many to be where modern pizza really took off. Zeffiro’s serves a traditional Neapolitan, or Naples style, thin crust pizza. The dough is made fresh daily from just four ingredients: Flour, water, salt and yeast. It’s left to rise for 24 hours. 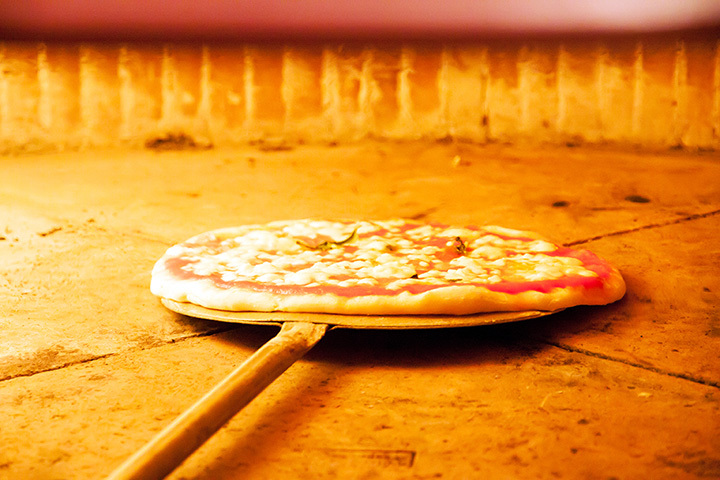 Pizzas are cooked in a 900-degree wood-fire oven that creates a flaky and crispy crust. If that weren’t enough of a taste sensation, toppings run the gamut from fresh asparagus to fennel sausage to Hatch green chile and a cornucopia of other ingredients. Fresh baked breads available too. Pizzaholics this is the place for you! You can’t eat just one slice. The thick crust has seasoned braided edges that are rolled in toasted sesame seeds. The cheese is tucked neatly under the edges for that stuffed crust experience. Gourmet toppings include items like anchovies, artichoke hearts, fresh basil pesto, capers, smoked salmon. This funky place may look like a throwback to the 1960s, but the food is absolutely contemporary. Good selection of microbrews, as well. Patio dining is taken to new heights at this small second story terrace restaurant overlooking the plaza. If you plan it right, you’ll get a front row seat for a spectacular New Mexico sunset in addition to a great tasting pizza. The house specialty pizzas are an eclectic mix of tastes. Topping the list is the roast chicken, green chile, toasted pinon nuts with cotija and asader with alfredo sauce on a blue corn crust. Close behind is the lobster, shrimp, applewood smoked bacon, truffle oil and four cheeses. Or build a pizza to suit your own tastes. No messing around here, this is New York-style pizza with a New Mexican edge. The pizzas begin with a dough and marinara sauce that’s made daily, from scratch. The southwestern flair comes from green chile, jalapenos, fire-roasted red peppers or a spicy marinara option. The pizzas are hand-tossed and it’s quite a floor show. Once made, the pies are baked in a super-hot oven and arrive at your table piping hot. Sizes range from a personal 10 inch to a large 18 inch. Pizza in squares, not triangular shaped slices?! That would be an outrage if the pie here weren’t as good as it is. This was the first pizza place in town and for more than 30 years the owners have been serving up flat crust pizza with all the works to the residents of and travelers through Valencia County. The menu is small but packed with flavor. The spinach and artichoke is a local favorite and the green chile pie is hot and spicy.